Anyone considering or planning an African safari will be faced with a number of difficult choices. Destination - where do you most want to go on safari? Duration - how much time do you have? Getting there - what's involved? Once there - self-drive or join a tour group? What to take - travel light or dress for dinner? The list is by no means exhaustive. Other questions will arise (can we take the children? ), while for some the answers will be more clearcut. You may, for example, have seen a National Geo program on Botswana's Okavango Delta - or the Serengeti migration - and that's where you're determined to go. For others, it's particular birds - or the desert scenery of the Kalahari - that appeals. The choices - in destination, type of accommodation, and costs - for an African safari are enormous, so the more you can limit the variables, the easier it will be to make a decision. 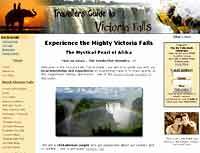 Travellers Guide to Victoria Falls - A comprehensive travel guide to the Victoria Falls and surrounding areas, including a wealth of information about Zimbabwe, its people, art, culture, history, and folklore. The site is compiled by a couple with many years of experience working in the Zimbabwe travel and hospitality industry. Their hands-on knowledge, passion, and birds-eye perspective provide unique insights indispensible to anyone planning a visit to the Victoria Falls. 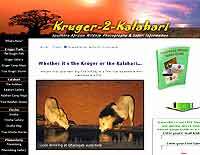 Kruger to Kalahari Safari Guide - Similar to the site above, this is not a safari operator's website full of hype. Instead, it's published by Mario & Jenny Fazekas, a photographer couple who've done more than a 100 self-drive safaris to some of southern Africa's prime safari destinations, including the Kruger National Park, Etosha in Namibia, and the remote Kalahari. They draw on their first-hand experience to provide unbiased advice about the above areas, including getting there, accommodation, costs, plus expert photo tips. SouthAfrica.net - the official South African Tourism website, providing "the most comprehensive online source of information on travel to and in South Africa".